Farro is highly versatile; aside from its inclusion in stuffings, it can be eaten as a hot breakfast cereal, tossed into a salad, served as a side dish, and cooked like risotto in the ever-popular dish farrotto. It's one of the oldest recorded grains, dating back at least 10,000 years-- farro graced pharohs' halls and kept the Roman legions marching. Farro is a whole grain so it's great at lowering bad cholesterol and protecting against Type 2 diabetes and heart disease, and it's extremely nutritious. 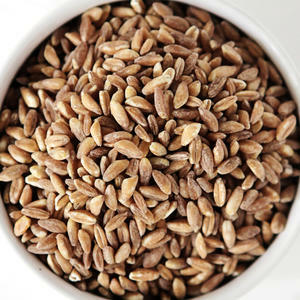 Farro is full of protein and fiber and is a good source of Vitamins A, B, C, and E, iron, and magnesium. Farro is a low-gluten grain and is easy on sensitive stomachs. Farro is cooked like any other grain. You simply cover it with water, bring it to a boil, and let it simmer until it's al dente. Perfect farro should be tender enough to bite, but still chewy and springy.